This is my first time posting a Currently - but I have been reading them - well it seems like forever. That`s right it says that I am turning 40 - I am a New Year`s Baby - just ask my mom who never lets me forget how I ruined her New Years by making her spend the entire time in the hospital! One of the joys of having just recently started this blog is that I can post things that others did way back in August/September!! I took my own kids into my classroom today - to get away from their still sick dad and to help me tidy up a few things in my classroom (the joys of having girls that love helping in my classroom!). I decided to take a few pics of my classroom to share with you. This is a picture of my Brightlinks - my girls were playing SharkBait/Hangman on it. It has quickly become my must have, can't live without resource! This is a pic of our document camera - the kids love seeing their work up on the Brightlinks - especially useful when discussing each others math problem solving. This is our behaviour clip chart, that I got from The Inspired Apple and our daily agenda and learning goals. This is a pic that goes with our classroom economy - students earn money (if I am being honest I hardly ever take money away - I just give to students on task and the others notice). Every 6 weeks we have a classroom store to spend our money. These are my girls organizing classroom supply bins - I job I love to pass on to them! Tucked in this corner is our writing area, the Voice board is from Ladybug Teacher Files and the Writer's Eye is from First Grade Fresh (I believe - if not I am happy to give credit wherever it is due). These are our writer's eye glasses (3D movie glasses with no lenses) and our celebrity editing pals - an idea I got from Teacher Tipster. This is our bucket filling area - we use the books sign out part of our reading cart to leave notes to fill each other's buckets - each student has a slot - we do not actually use it to sign out books! On our windows we have book themes and genres, I put up pictures of books we have read to help students make text to text connections. I took this idea from Beth Newingham but made my own to fit my themes and windows. 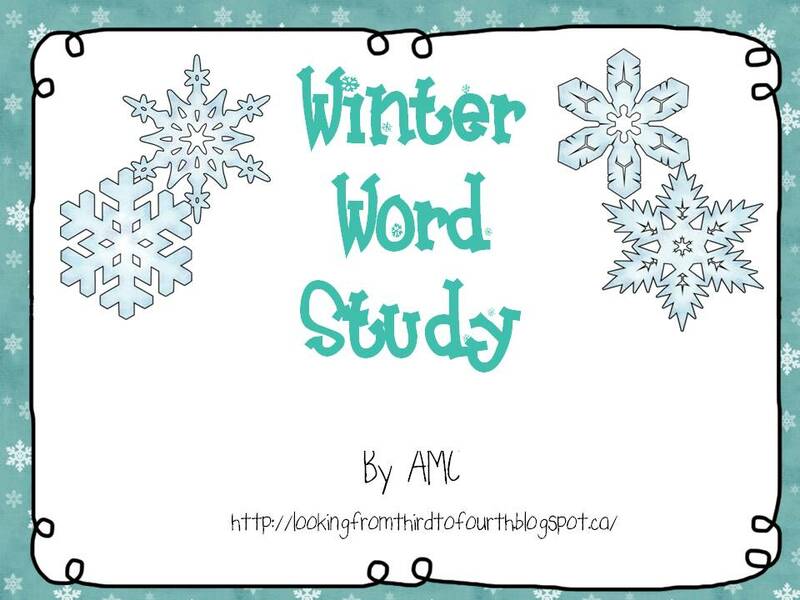 This is our word study area - ready for Winter Word Study! This is our Math Word Wall - soon to switch over to multiplication! This is the beginning of our non-fiction text feature board - we will be starting our unit the first week back. Our regular word wall, the binder has word lists, separated by theme - strong verbs, transition words, adjectives etc. Well there is a snapshot of my classroom - a work in progress to be sure. 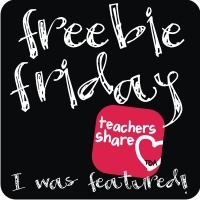 A big thanks to all the bloggers and pinners out there who have so generously shared their classrooms and freebies with me!! I have a very large to do list - but I also have a sick husband, a driveway covered with snow, 2 daughters having sleepovers and a very needy dog! 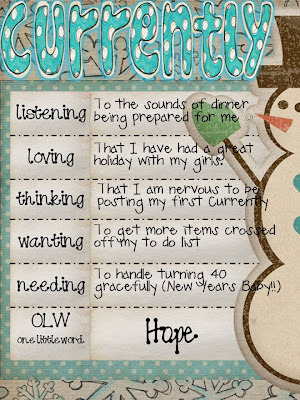 So what am I doing - avoiding the things on my list I should be doing and getting some things ready for back to school. 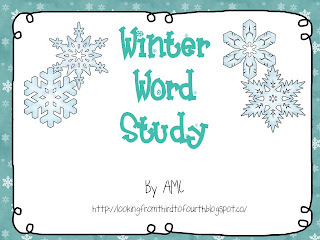 I already know that I would be using my Winter Word Study Unit during January - I am starting on the first Monday back with the compound word activities - we will need to move around! Since we will need to move around a lot and have probably forgotten what we knew about telling time - due to present and sugar overload - I made some clocks to use as a whole class activity to practice telling time to the nearest 5 minute mark. I will be placing the analogue and digital clocks around the room, students will have to find the analogue clock - record the time, then find the matching digital clock and record the letter (to spell a word and the first one is a compound word - snowball - which will lead into our word study, yeah!). This should get some of our energy out so that the Grade 4`s can move on to the text book and work on telling time to the nearest minute and the Grade 3`s can continue with time to the nearest 5 minute mark. On Wednesday we will move on to the dreaded ELAPSED time and will use the clocks to walk around the class some more! 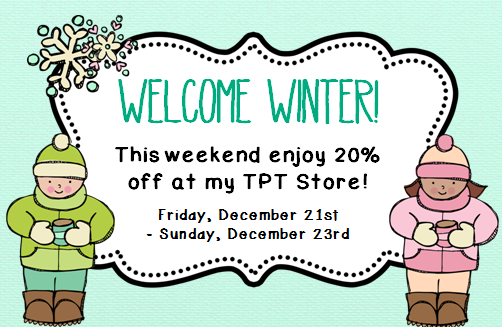 I posted the snowflake clocks on my TPT store if you are interested - they are free! Drink less Pepsi - which helps me to eat less chips, which helps me to eat less dip! Hopefully this will also help me to lose weight. Along the same line - take our dog for longer walks - even when it is so cold, or so hot or my favourite show is about to start! Work harder to develop and implement inquiry based math lessons - not just at the beginning of the unit, but yes dare I say it - during the unit too! I`m part of our board`s Junior Math Numeracy Network so hopefully our workshops and meetings will keep me on track. I am a long time Blog reader, really new Blog writer, but my goal is to be a better Blog commenter (is that even a real word?!?). After starting my own Blog I realized the importance of comments - knowing that someone has read your blog and had a positive (hopefully) reaction to it can really make it worthwhile. I use to think why comment if all I had to say was "Great idea" or "So Cute". 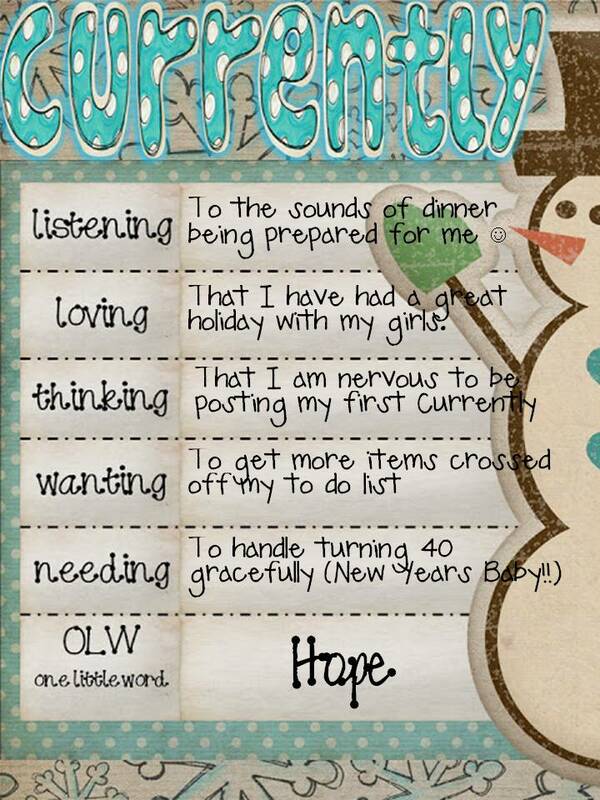 But now I see the importance of taking the time to comment, especially to just say thanks! So that is my goal - to let other Bloggers know just how much I appreciate their work and their sharing! I was going to have a Boxing Day Sale but have joined this Linky Party and am starting the sale today. 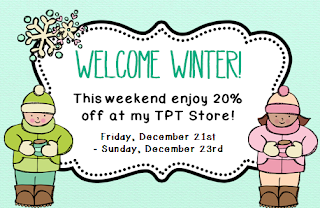 Here is a link to my TPT store. There are a lot of sellers linking up so I will be heading over to shop too! Tomorrow is our Christmas concert and I was hoping to change our hallway bulletin board before all the parents were coming through our school. Since we are singing two songs (see earlier post for links) I thought we would make ourselves into Christmas Carolers for our art today. I used this Pinterest post for inspiration. We also watched A Charlie Brown Christmas to watch the characters sing with their heads up and noses pointed to the sky (or just so we could watch a movie!!). We changed up the art a little so that there were arms and they were holding Christmas song pages. I have included the tracers we used for this art - it made a lovely bulletin board but would also be great in January. Some students made their arms 3D, others added snow, some even added hair and a tongue! Our school week started out with an early Monday morning meeting to discuss the tragic events that took place at SandyHook Elementary School. We took time to remember the victims and their families in our prayers and prepare ourselves for any questions our students might have. It was great to see their smiling faces at 8:30. Even though it is a crazy week and the students are having a hard time focussing on any thing other than Chrismtas I am trying to get a little (I mean a very little) teaching in. Math is the one subject we seem to be doing the best with. We have reviewed temperature benchmarks and how to read a thermometer. We have also worked on calendar reading skills. Tomorrow we will review telling time to the nearest 5 minute mark. We will also be working on writing the time in two ways (11:15 and quarter after eleven). I am focussing on these two skills from the Grade 3 Ontario expectations - we will hit elapsed time and time to the nearest minute after the holidays! To make it a little more Christmas-y, I made these Santa clock worksheets for the students to work on after our group lesson. Maybe it is too late for you to use this year - but I thought I would share. Click here for the worksheets. In a previous post I shared the Time mini-anchor chart posters I use - check them out. 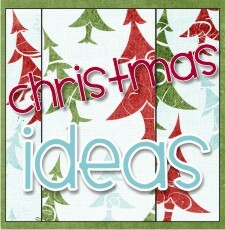 Check back tomorrow for our Christmas bulletin board art! Why is it that it feels like the Christmas holidays will never get here but at the same time, time is going by sooo fast I will not have everything done and ready - at home or at school?!?! I would like to get one more Christmas Craft in next week - but can't decide between Reindeer ornaments (need paint, wooden hearts and pompoms, have googly eyes). or Christmas pictures (need frames from the dollar store, plasticene in class already). One of my teaching buddies and I quickly put together our Christmas doors (thank you for the Pinspiration and the Inspiration) and the kids love them!! We also quickly revamped our Bump it up bulletin board as it was this week's "Look For" from our principal. This is the grade 1/2 board - they are working on improving their Christmas sentences. This is their anchor chart for words to use. Here is our grade 3/4 board - we are working on persuasive letter writing. 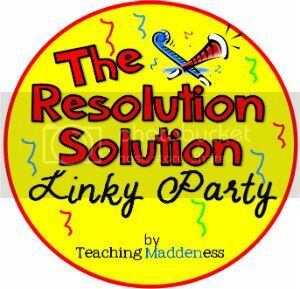 Very exciting - my first linky party!! 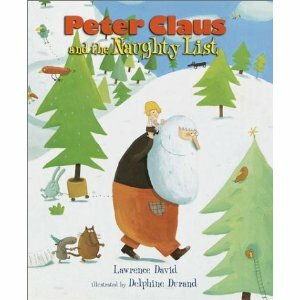 The book I am suggesting is Peter Claus and the Naughty List. I use it as part of our persuasive letter writing unit. Peter is Santa`s son and he is on the naughtly list. He feels bad for all the kids on the list so he goes about getting them on to the nice list. Since he did this nice thing he too is moved to the nice list. We use it as a jumping off point for writing a persuasive letter to Santa explaining why we should be on the nice list. Click here for the writing activity. Today we started the process of turning our classroom into Santa's Workshop and ourselves into elves. We started the day with a Secret Elf Pal draw. Each student picked a name of a fellow student from my elf hat. Then they decorated their brown bag stocking and put their name on it so their Secret Elf Pal will have a spot to make deliveries. Each day we will be doing an Elf Task card which were inspired by I Love My Classroom's post on her Elf Task Card freebie. Today we made our second Christmas craft/ornament. I took the inspiration for these cupcake ornaments from Run, Miss Nelson's Got the Camera (only hers are way cuter - but I could not find all the supplies as I shopped in desperation on Saturday night with my two very tired and annoyed children!). We used red ornaments from Dollarama, Christmas cupcake holders from Walmart, fake snow from Walmart, green sprinkles from my cupboard and red pompoms from the craft bin on my shelf. I made two with my daughters for samples. I learned that putting the ornament in straight and not too tight worked best. Every year our school holds a Christmas Concert during the last week before holidays - so we spend a good portion of December in rehearsals. Some days they go well with the kids smiling and singing and moving in unison - other days, not so much. Today was a "not so much" day as we performed for 1 other teacher (the actual music teacher). No smiling, lots of mumbling. Argh, some days it feels like you are never going to be ready - but of course they always shine at the actual concert and parent's love whatever their kids do. This year and last year we chose songs from K-8 music. Last year we did Blitzen's Boogie and this year we are doing We Will Jingle. I have a pretty creative class this year and a few students wrote lyrics for the song Gangam Style and we are doing a Christmas version - which is hillarious and gets stuck in my head for the rest of the day. Check out the website for some great music ideas. Yesterday we made our first Christmas craft of the season. I took this idea from a craft my daughter brought home three years ago (the joy of having kids the same age as the kids you teach!). It is very simple but looks great on our tree at home. All you need are styrofoam balls, sequins, marshmallows and straight pins. I had to actually go to Fabricland to get straight pins - the dollar store only had ones with fancy heads.The straight pin goes through the sequin, then the marshmallow and into the styrofoam ball. Cover the entire sphere (that's right we tied it into our math on 3D solids). Add a ribbon to hang and voila - a sparkly, snowflake ornament. Today we were finishing up our unit on 2D shapes by working on Tangram puzzles. We use the Math Makes Sense program and the Grade 3 Strategies Toolkit asks students to make a square with different numbers of tans and then to try and create other shapes with various numbers of tans. I like the Strategy Toolkit problems - they really allow the students to explore - but they never give a structure for students to record their findings. This is always a big stumbling block for my grade 3's - how to organize their work and present it in a way that is understandable to anyone else!!!! (Of course their work always makes perfect sense to them). So I made up this to help them record their work. I also included mini tangrams for those students who could not draw their solution but could cut and paste it (I know contradicting my last math post - but what can I say). Here is the recording chart - maybe you can use it in your class too!